Why is this a bid idea? Well aside from losing your valuable bees it could cause a nuisance to your neighbors. So be a responsible beekeeper. Here are a few tips. When a colony of bees becomes over crowded, the queen pheromone ( her scent) can not be detected by the workers in parts of the hive, hence they believe she is gone and start making queen cells to replace her even though she is still there. So to reduce the risk of this happening give your bees plenty of room BEFORE they need it. Add supers in advance of their needs. If you have a queen that is two years or older think about requeening if your bees keep attempting to swarm. It could be that your queen was not properly mated and the workers detect this and are logically insuring the future survival of the colony by replacing her. It could be that your queen is getting too old and as a result her queen pheromone is drying up. The workers can’t smell her and think she is not there. This should only be done once you have found your queen, put her safely in a queen cage, then in your pocket. The idea is to work with your bees and their natural instinct to swarm outside the hive. Once queen cells are in place this can sometimes be a point of no return and your bees will swarm regardless. 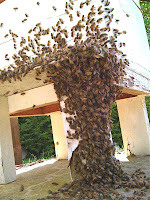 If you have removed all the queen cells and you now believe that this will stop your bees from swarming-you are wrong. Your bees don’t recognise that you have removed all the queen cells, they believe that all is well for a successful swarm. They believe that they have left the colony with a future queen and the ability to carry on. So within the next few days, mid day, off they go. You however have destroyed all the queen cells and now the colony is compromised. Yes your workers can begin to make new queen cells from the remaining eggs, but there will be a break in the brood pattern which could have been avoided. (there is more to beekeeping than meets the eye!) So here’s what we do! On a nice sunny, calm day, queen safely in her cage, in your pocket. Remove one brood frame at a time and SHAKE all the bees off the frame in front of the hive. Do this until all the bees have been shaken off each frame. Remove ALL queen cells you see. This is a perfect opportunity to check for queen cells as all bees are off the comb and you can clearly see the entire surface. Use this time to clean the frame or even replace a frame if the comb is old. Put them back in order of how you took them out. Once complete, all frames back in place, release your queen back into the brood box by letting her crawl out of the cage onto the top of the brood frames. She will crawl down between the frames. Don’t shake her out of the cage, you could flip her outside the hive. I have seen it done. Close up the hive. Your bees now feel that they did in fact swarm which was on the cards. You have triggered that response within a controlled environment. This technique works quite well. Remember bees have a mind of their own and even the best laid plans do not always work. This is what makes beekeeping an interesting challenge. If you find you have tried this three times and they still will not stop preparing to swarm try no five. If you have tried nos 1-4 and your bees keep building up in size and there is no way to stop them making queen cells think about dividing the hive. This entails removing half the frames to a new empty hive in a new location. You will leave half the viable brood frames and two queen cells only in the original position. Next you will take the other half of the viable brood frames to the new empty hive WITH THE QUEEN! The idea is that you have worked with the bees natural instinct to swarm. By removing half the bees and frames with the original queen to a new location you have produced the scenario of them swarming. Only you are in control! You have decided when and where. The original hive now has less bees and two queen cells. They are happy in the knowledge that all is well and their colony has swarmed as planned. In the next seven days a queen will emerge and head that colony. You now have two hives and two decisions. You can keep both going or reunite them back to one hive after deciding which queen you will keep. You will need to remove one queen or they will fight, injuring each other of causing the new queen to fly out of the hive (swarming) taking half the bees with her, which was what we were trying to avoid. So there are a few tips for you to add to your ever growing beekeeping knowledge base. Give it a try, tailor it to your needs. remember beekeeping still is not an exact science. Bees are wild creatures and will continue to surprise us. Keep an eye on this site, we will always be posting useful tips throughout the year. Any questions post a comment and we will try to respond. Have fun!